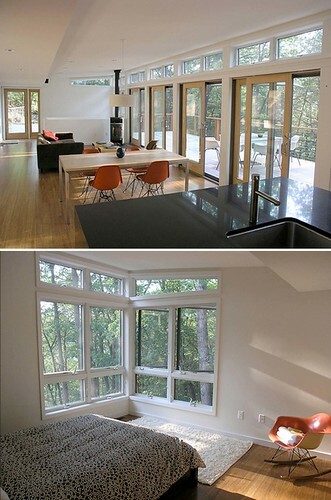 I love Brooklyn but sometimes I secretly dream of living in a big sunny and sparse house in the middle of nowhere. This place is perfect. 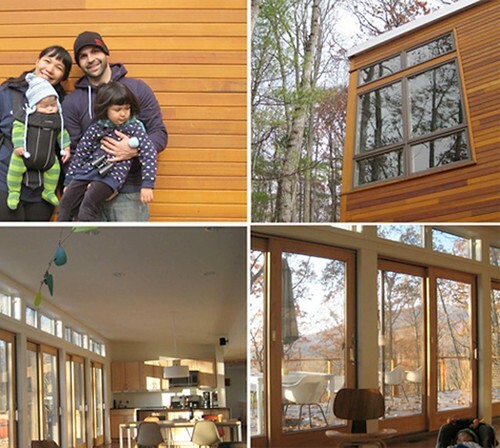 I saw it on Poppytalk when Stu and Janet of Three Potato Four guest blogged about their vacation in the Lost River Modern, a prefab cabin in the woods of West Virginia. On a steep hill in the mountains, looking out through a wall of windows, they were lucky enough to catch the last of the Fall leaves. The cabin was designed by the award-winning, New York City-based architecture firm Resolution:4 Architecture (who also created the original dwell home). I’m usually drawn to old architecture like Victorian houses but these modern ones seem to let you commune with your surroundings like Frank Lloyd Wright’s Fallingwater. I would love to stay in Lost River one day. I don’t know if Dave could handle being without his iphone though. Here’s where I’ve mentioned the fabulous Three Potato Four on Maquette. Aren’t they are beautiful family? For you, darling, I’d go 2 straight days without Internet access. two days only? That’s all you can give me? They are a cute family. & that bedroom is calling my name; love those huge windows. Oh my, what an awesome house. And what a cute family.